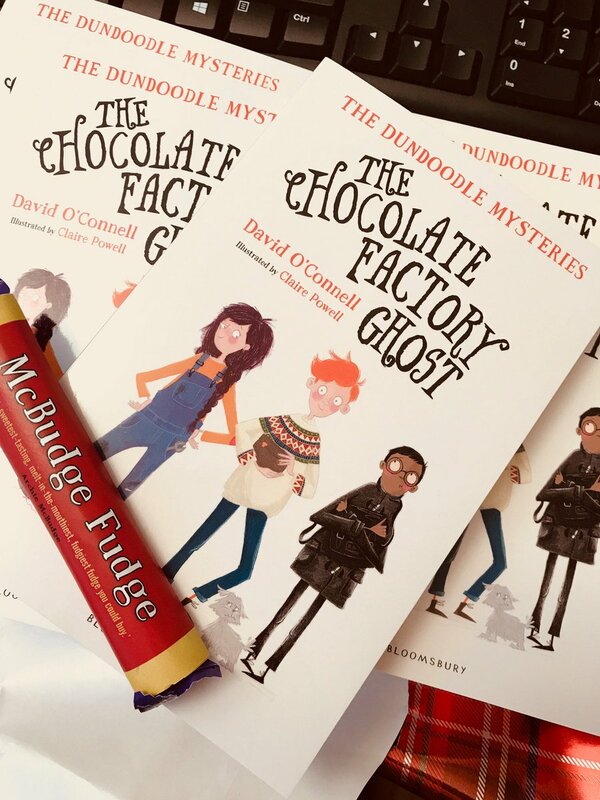 The proof of this book came with a bar of McBudge Fudge – actually a bar of Cadbury’s Fudge, with a wrapper advertising McBudge Fudge wrapped around it. How could I not start the book, with that sort of incentive? I ate the fudge (and very good it was too) with a hot cup of tea and began to read. I don’t think I can remember having a finger of fudge since the above advert was on ‘the box’. It had a ‘jingle’ that started with ‘A finger of Fudge is just enough, to give your kids a treat…’ It’s hot-wired into my brain…I could sing it for you, if you were here and not there… not very well, but I could. Actually, not only did Bloomsbury send me chocolate, but they also supplied me with a very good book too. What more could anyone want? They did rather well. I haven’t got very far with this yet, but it has the same feel as Sylvia Bishop’s Bookshop Girl and that isn’t a bad thing. At the beginning of the story Archie McBrudge visits Honeystone Hall with his mother to meet a solicitor. He explains that not only has Archie has inherited the hall, but also the world famous McBudge Fudge Factory, as well as his great-uncle’s gardening tools to boot! I suppose it could be said to have essences of Charlie and the Chocolate Factory (Roald Dahl) – Archie is set a series of tests he has to pass, and has met one or two very strange people. An extraordinary & ancient butler along with a young lass, who works as a plumber at the hall…and things are definitely not what they seem. I am going to enjoy reading this in bed tonight – its a book for curling up with, especially when it is very, very cold. Which it is. I have my oil heater on – in an attempt to warm myself up. One of the reasons I like books are the odd phrases authors use to describe things – in this case a character is described as looking like a ‘forlorn slug.’ Which is wonderful. I have never really liked slugs (snails, I approve of, even though they destroy my plants), and I have never thought of them as being anything…however, I shall now think of them differently and will examine them carefully in the future to see if any of them look forlorn. I digress. I am sure this is going to be one of those books that readers who are beginning to enjoy reading for themselves and have a little confidence will relish. Lastly – I looked up forlorn slug then chocolate slug on the Internet. Sadly there was nothing that really depicted the former concept for me so, you aren’t getting a picture of one. The chocolate slugs sold in California (Humboldt) look, regrettably, rather revolting (even if they are chocolate), but then I expect they are supposed to. The Internet did, though, bring up pictures of Chocolate Frogs – part of the Harry Potter franchise. We sell these now – at £4.99 a frog. You do, however, get a mystery card to collect…to go with it. Whether these are lenticular or not, is not something I can answer. Those produced by Cadbury’s years ago, were – and they made very good bookmarks. I hope these have moving pictures too…I have not, though eaten one, so I don’t know. Anyway – to get back to The Chocolate Factory Ghost – if a book can refer to forlorn slugs – you can’t really go wrong – imagination, a good story, and wonderful inventive descriptive English – what more could you want? As for me, I’m touched. I hope I continue to give the right reviews to the right books to the right people! You may be pleased to learn – I have just found out how I can illustrate my latest posts about Madagascar with some of my pictures – late last night…so there will be picture soon!